Airtel is now providing Twitter for free without any charges for the customers to enjoy free access to Twitter through mobile browsers by visiting http://mobile.twitter.com and enjoy posting Tweets, keeping up with what’s happening in the world, and finding and following friends, celebrities, news and more. 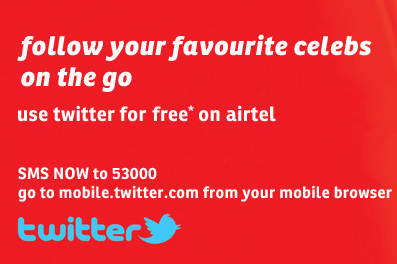 Go to http://mobile.twitter.com from your mobile browser and enjoy free browsing till the promo period ends. This promo period ends on 1st Of March 2012. So don't wait, start tweeting now !! !